Beloved ones, I would speak to you this day on the power of transformative prayer. The Word made flesh¹ is the precipitation in matter form of the vibrations of the Godhead through the sounding of the sound of the sacred OM. The flowering of sound through the tonal qualities of each alphabetic utterance of words and combinations of words as mantras is for the purpose of extending the voice of God into your world. And holy, transformative prayer is one aspect and example of the sacred science of sound through spoken words. In all cultures and religious movements, prayer has been the cornerstone of spiritual practices that bind you directly to God through the stream of the Word, as Above so below. Even as the Word descends to you through the agency of the Holy Spirit as the frequencies of the Christos, the light that lighteth every man, woman and child who is born upon earth,² so that same light ascends as you employ the gift of Selfhood through the Christ-flame within as you pray. Invocative prayer first convokes the presence of God’s beingness where you are through calling upon the name of God.³ Whether you utter the unutterable Word or you allow the flow of that Word through you in an action of speech through your throat chakra to step down the frequencies of the Godhead in its various manifestations of beingness through numerous sacred names, you tie into the perfection that symbology of the syllables that you utter represent as a pure vibration of light. The transformative power of prayer is manifest as you allow the higher tonal resonance of the Godhead to vibrate within your being at all levels, through every cell, every system, focused through your chakras and meridians, revififying your life and then in an expressive manner blessing all life. If, through presence awareness, you allow the beautiful aspects of the Godhead in all its expressive virtues and divine qualities to flow through you in a pure stream of light, then the power of transformation in your world moves you day by day into higher consciousness. But if there is not the fullness of awareness through a vibration of reverential devotion, praise and divine sublimation manifesting and resonating through your whole being, then you shortchange the potential power of fohat to recreate you, day by day, through your rituals and prayer sessions, beloved ones. 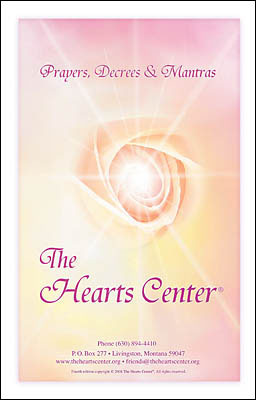 The quantity of transformative power through prayer that you have access to is directly related to the quality of your heart emanations, maximized through holy vision and then grounded within your living environment where you abide, through the sacred throat chakra which squares the action of light in four dimensions of being through the sixteen petals of this power center. As the tonal frequencies are released in harmony and in a resounding circular and spherical rendering that continues to expand both outward and inward, you re-energize life everywhere, you receive the direct and specific radiance that you, as a God-being, require in that moment of holy presence. Keep Your Internal Orchestra in Tune! Blessed ones, although you are a singular being in one sense, each of you is also an orchestra of many vibrations through the constantly spinning petals of your chakras which vibrate and whirl at different rates. As you purify consciousness by meditating upon the perfection within the white-fire core of each chakra and see the Godliness within that sacred center, you may employ the science of mantric sound emanations to resonate within through these divine contact points. And the internal orchestra may play with great synchronicity, harmony and beauty. But if one or another chakra is sluggish, not quite spinning in its true and divinely natal rate, then your prayers, songs and mantras will not affect the highest transformative action within you. Therefore, I come this day to begin to work with you at a more personal level, if you would have me, to teach you through the messenger and through some who have mastered the science of sound, certain nuances of this science that few of you have fully employed and utilized in its highest aspects. You must all become singers of the new song4 through acceptance first of the compassionate heart fully within. You must begin to know a higher personal resonance, first by resolving your internal conflicts so that the divine Word, when it comes, may not be constricted within you each time you open your mouth and heart to pray. The benefits of learning and intoning the ancient, fohatic chants of East and West will be worth the effort, beloved ones. The changes in your personal world will move you into a new stream of cosmic connectivity that will allow the beginnings of the music of the spheres to be felt, heard and then accepted within your being, first, within your heart and then expanding to every molecule of selfhood in God. Imagine It. Invoke It. Be It. I am the chohan of the Word made flesh¹ within you, the master of the science of invocative prayer which may now begin to flow within you in a more wonderful, divine way than, even a few short months or years ago, you could ever have imagined. Begin to imagine it, to invoke it, to be it. I am El Morya. And through the holy will of God it will be so! And through the name, I AM THAT I AM, that new song mentioned by John the Revelator will be yours to sing forevermore. I thank you, blessed ones, and I bid you adieu. [Messenger’s comments: I consider this a landmark dictation from the Master Morya to whom I am very grateful for his great love for us personally that he would consider working with us individually in this manner. I look forward to being his instrument for whatever teaching that he would deliver in this sacred science in coming days and weeks and months. All that we have done thus far is preparatory to a new level of harmony. Some have recently been asked to consider partaking of a voice fast. I believe that this is for the purpose of preparing themselves for some new frequencies that may come through their voice when first the voice itself is rested through silence and hopefully rests in presence at a higher level. It may be a discipline that each and every one of you in some way may desire to partake of even for a half day or a day or a couple of days—watching your words, the vibration of sound that you allow to flow through your throat chakra, seeing how sacred this center truly is and how also in an unguarded moment it can be the instrument for great darkness if we are not on guard and do not bless life through this sacred center. Let us be careful that because we have used the science of sound and mantra and the Word to flow through us day by day that we never allow energies of darkness to be used through our throat chakra because they then are empowered by the thrust of light that we have accumulated in all the years that we have been praying. When this occurs through individuals who are not conscious in a moment, it is as if there is a scouring out of their throat chakra of all the light that has flowed through it and is completely turned to darkness and it is truly a sad state for that one. Release of the Fire Breath of God through the Seven Rainbow Rays.